One of the major pillars of a successful business is the accounting department, and if it is still relying on manual processes, then there is a good chance that you will survive with your business. Manual processes take a lot of time and effort in completing accounting processes. The accounting team needs to spend a huge portion of their time in looking for information, analyzing different aspects, formatting documents, routing them for review & approval, and storing it all. If you want to improve the overall productivity of your business, you need to adopt the automating accounting processes. This will help you achieve an instant return on investment with ease. It is an ideal technology that can help you solve all your accounting problems associated with your business. But before this, I will explore the meaning of Process Automation tool. 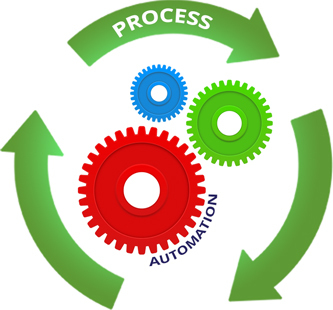 In a general term, Process Automation is an advanced technology used to streamline any process (business or financial) via the use of computers and computer software. In fact, automated processes require less human interference and also save a lot of productivity cost. Automation allows accounting department to create and follow a well-managed practice that can help you run a successful business, without any hustle-bustle. There are some common process solutions such as the use of workflow automation, document management, and data capture for invoice scanning and capture. The technology also offers workflow processing; payment processing, business intelligence and other tools that can help you solve some of the most common accounting issues. As an accounting professional, your primary responsibility is to verify multiple account balances and invoices. For this, you need to compare thousands sources of data such as invoices, bank statements, purchase orders, etc. With the Workflow Automation, you can enable your business to create and specify a single process for the how work gets completed. The tool stores and tracks documents, and then assigns tasks after gathering all the necessary information. It also provides visibility into your business tasks and allows the AP environment to know where documents house in the approval process. It accelerates the approval process. Late payment fees are one of the biggest disadvantages of slow manual processes in accounting department. It reduces your company’s ability to generate financial benefits such as early payments discounts. But with the introduction of automated processes your business can improve the efficiency, minimize cycle time, and eliminate redundancy by managing your business processes automatically. There is a lot of responsibility on accounting professionals. They need to ensure whether all the data into the business is relevant, precise, and updated or not. If you want run a successful business, you need to make a use of automated processes to file records, manage data via the use of computer software. With the use of Data Capture tool, you can both convert documents into the business-ready data, and also validate the paperwork against the other data that is stored in your system. A high level of information exchange is the primary requirement of accounting department. Invoices come in from multiple suppliers in different layouts and delivery formats such as fax, EDI, email, etc. And while the documents may be backed up in such a way that makes sense to each employee that they are not in centralized repository where other users can quickly and efficiently access them. Luckily, automation processes offer Document Management tool that helps you manage all your documents and information within your organization. It reduces the high cost of paper storage and also brings efficiency into the business. Manual invoice processing could maximize the cost of payment processing. Plus, it brings inefficiency to an organization. With the use of process automation, you can eradicate the manual tasks that are restricting your accounting department from utilizing their time more productively. Your employees can concentrate more on strategic tasks and helps you generate more revenue. The use of process accounting automation can help your business in many ways. It reduces human errors; efficiently allocate your resources, faster response to crucial system problems and much more. Andrew is a passionate writer and has actively writing useful blogs and articles about IT Services and Network Supports. He works for Syscon-Inc, That Provide the best workflow automation software that can fulfill your organization’s specific needs quickly and efficiently. Connect with social profile on Linkedin and Twitter.